So the good life includes 1) employment, 2) home ownership and 3) a great education for your children. It’s pretty pedestrian stuff and certainly a world away from Aristotle’s idea of the good life. In particular, for Aristotle the good life encompasses good choices, good actions, good habits and good character. The highest objective that we can obtain is happiness, and happiness is a legitimate aim of human life. Nonetheless, his idea of happiness goes beyond simple pleasure to include the idea of a life well-lived; that is, a meaningful life that transcends one’s own individual existence. Further, man being a social animal, such a state of happiness can only be achieved within a communal setting. In the modern happiness literature, Aristotle’s happiness, or a life well-lived, is often referred to as eudaimonia or flourishing. It complements the two other main categories of happiness: life satisfaction and affect (positive and negative feelings). To the coalition government’s great credit, such happiness concepts are now being tracked by the Office of National Statistics in its Personal Well-Being in the UK survey. Nonetheless, it is a shame that none of this is anywhere to be seen in the manifesto. 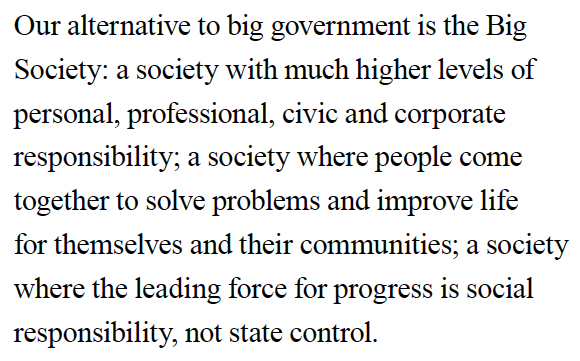 For example, a major plank within the 2010 manifesto was the idea of creating a Big Society. Moreover, how this would be achieved would have resonated with Aristotle. The recognition is that individuals will not necessarily engage in higher social relationships if left to their own devices: the state must ‘agitate’, ‘catalyse’ and ‘galvanise”. Aristotle put this more bluntly: individuals need to be taught how to lead a good life, and by such teaching they could then go beyond pursuing base material needs alone. 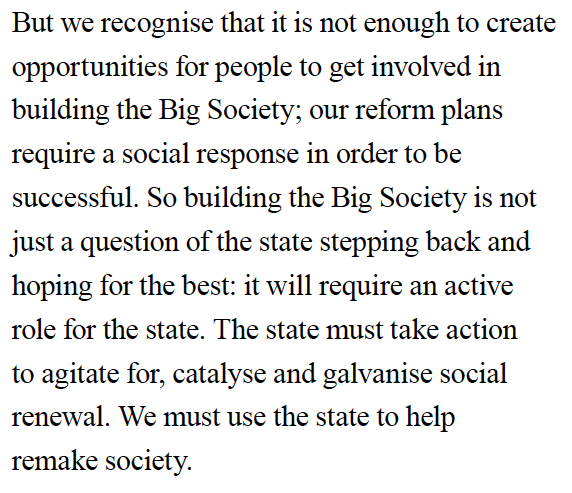 In the new Conservative Party manifesto, the concept of the Big Society still remains, but is pared back considerably. In particular, the state’s explicit role in catalysing social renewal is gone. Indeed, intellectually, the new 2015 manifesto is far inferior to the 2010 one. Politics is reduced to a shopping list rather than a philosophical endeavour. At this point, those of you of a libertarian disposition may applaud the Conservative Party’s decision to trash the idea that the state should influence how people live their lives. To such an argument, I would answer that global capitalism is just one vast machine trying to persuade people to do just that: live their lives in a particular way. Each day, we are agitated, catalysed, galvanised, exhorted and emotionally blackmailed to seek happiness through the purchase of goods and services. The not so subtle message is that if we don’t buy this or that then we are bad spouses, parents or lovers. In my humble opinion, a little balance would be a source of freedom rather than tyranny. This entry was posted in Happiness, Post Growth and tagged a good life, Aristotle, David Camerion, The Conservative manifesto 2010, The Conservative manifesto 2015, the good life. Bookmark the permalink. A good point at the end. Neoliberal ideology is (quite literally) dehumanising in that people’s worth is defined and solely in terms of the monetary value of their economic transactions. On a more mundane party-political level, I am surprised by how inept the Conservative campaign has been: nasty personalised attacks and reckless unfunded tax/spending promises with a particularly stupid right-to-buy housing policy.